Your feedback about classes you have participated in at UUCMP will help us tailor our offerings to the interests of our students. Instructors who would like to present a class or workshop are invited to make a proposal. A sponsor will work with instructors if their proposal is approved. Adult Life Enrichment committee members often act as sponsors: proposing a class idea, recruiting instructors, scheduling the facility space for the class, and handling the publicity. Would you enjoty a cup of coffee or teach, and the opportunity to chat with the ministers, as well as a few other members and firends of UUCMP? If so, be sure to join our First Friday Coffee! 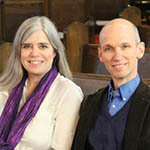 Reverends Elaine and Axel will host of gathering for members and friends in the Blue Room of Canterbury Woods, 651 Sinex Avenue, Pacific Grove. Whether you are a resident there, or live elsewhere, please join us for a hot beverage and friendly conversation. All men are invited to the monthly Men’s Breakfast Group. Please let Marsh Pitman (mensbreakfast@uucmp.org) know if you will attend, so we can plan enough food. We welcome all women to our meetings in the Fireplace Room where we explore an ever-changing array of topics.